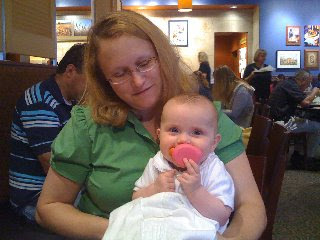 So yesterday I went to lunch with my friend Becky and her little girl Clare. I'd just seen her a month ago. But I swear she's grown a foot. You know I always claim that I don't like to have my picture taken. I'm uber critical about my appearance. 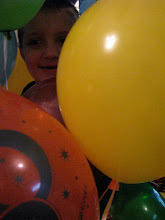 But I seem to have quite a number of pictures of myself on this blog. Hm. That's the 'problem' with cell phones that have cameras. It's great for parents to catch adorable moments of their children. But the unsuspecting childless friends get caught in the line of fire. Yipes! Anyway, Clare was demonstrating how she could fit the small rubber duck in her mouth. Which was pretty funny. And of course it was sent to Daddy. Thanks Becky and Clare. I enjoyed our lunch together.